This cabbage, red potato and sauerkraut soup recipe is best prepared on the stovetop in a large soup pot. It is also great for leftovers, and can be stored in the covered pot in the refrigerator for a few days. This soup is a variation of our Transylvanian Goulash with Brown Rice recipe. Peel and wash the onions and garlic (if used), dice the onions and crush the garlic and add to the soup pot with 2 quarts of cold water. Add the crushed tomatoes, bay leaves, caraway seeds, paprika, and mix well. Turn the heat on to high until the water begins to boil, and then reduce the heat to simmer. While the water is heating in the pot, wash and clean the cabbage and red potatoes (or another kind of potato if you don’t have red), and remove the eyes or bad spots. Slice and cut the cabbages into bite sized pieces, coarsely dice the potatoes, and add to the soup pot and mix well. 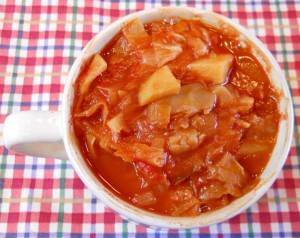 Initially the veggies may rise above the liquid, but by mixing the soup every five minutes or so, the cabbage will wilt, and the liquid will just cover the veggies. Add the sauerkraut and mix in thoroughly, and continue simmering the soup until all the veggies are cooked. Turn off the heat and mix in the lemon juice, if desired. Total preparation and cooking time is a little less than 2 hours. I made this soup on Sunday and the only change I made was to add red lentils. I also did not have red potatoes on hand so I just used Russet ones. This is one of the best soups I have made in a long time! I have been vegan for several years, but my husband is an omnivore and it can sometimes be hard to cook for him. He absolutely loved this soup though and has been raving about it the last few days! Thanks for sharing. I love the simplicity and whole food ingredients in the recipes you share on your site. I have tried many other recipes here too. Very good! You’re welcome, and we’re very happy to hear about your pre-vegan husband’s enjoyment. We also like to hear about people varying our recipes and learning about how they come out. You made our day! Thank you.